The second largest ethnic group in Kyrgyzstan is Uzbek: according to statistical data of 2015, there are about 900 thousand people, which is almost 15% of the total number of residents. At the same time, there is no opportunity for Uzbek youth to get a high-quality secondary education and even less a higher education. In Kyrgyzstan, there are 91 schools with Uzbek language of instruction, and about 30 thousand pupils graduate them annually. For comparison: according to data at the beginning of 2016, the number of ethnic Kyrgyz in Uzbekistan is more than 420,000 people or 1.4 percent of the country's population. According to the media, there are 64 schools with Kyrgyz language of instruction and 27 Kyrgyz-Uzbek (both languages of instruction) schools in Uzbekistan; about 14 thousand children study there. The supply of educational literature is 93.2 percent: there is a special editorial staff at the “Uzbekiston” publishing house preparing textbooks for schools with the Kyrgyz language of instruction. Basic (6-10 years old) and secondary general education (11-18 years old) in Kyrgyzstan can be instructed in several languages: Kyrgyz, Russian, Uzbek (schools are located mainly in the southern regions) and Tajik. School graduates sit the nationwide exam (ORT) resulting into a certain score, according to which they can enter higher education. ORT system was introduced in 2002 and includes several sections: mathematics, analogies and additions, reading and understanding, practical grammar of the native language. According to the Ministry of Education of Kyrgyzstan, the results of the nationwide exam are mandatory for admission for higher education since 2011. 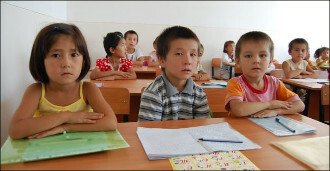 Until 2013, national testing had been conducted in three languages - Kyrgyz, Russian, and Uzbek. After the abolishment of ORT in Uzbek, graduates of Uzbek schools can choose to be tested in Kyrgyz or Russian. During the Soviet era, teaching staff for Uzbek schools in Kyrgyzstan was trained by Uzbekistan universities. Young Andijan or Tashkent Pedagogical Institutes graduates were sent to educational institutions in the southern regions of Kyrgyzstan, in predominantly ethnic Uzbek communities. In turn, graduates of Uzbek schools of Kyrgyzstan went to Uzbekistan for higher education. With the disintegration of the USSR, the paths of two neighbouring states - Kyrgyzstan and Uzbekistan - parted like ships at sea. Kyrgyzstan remained faithful to the Cyrillic alphabet, and Uzbekistan switched to the Latin alphabet. Uzbek textbooks in Cyrillic were no longer in need and sent to Kyrgyzstan. At some point it filled the shortage of textbooks and helped to hold up the schools instructing in Uzbek language in Kyrgyzstan. But these textbooks have dilapidated for almost three decades, and there is simply nowhere to take new ones. However, the current graduates of Uzbek schools are not able to enter Uzbekistan's universities, only because they are not trained to read and write using Latin letters. One of the Uzbek community leaders of Kyrgyzstan Bahtiyar Fattahov believes that the abolition of testing in the Uzbek language reduces the chances of Uzbek youth to receive higher education. ‘This initiative of the Ministry of Education is a direct violation of human rights,’ Mr Fattahov considers. What other teachers instructing in Uzbek think? The Fergana correspondent met with a dozen teachers and directors of Uzbek schools. Almost all of them believe that Uzbek-language education in Kyrgyzstan has no prospects. As the headmaster of the Russian-Uzbek school in Jalal-Abad oblast agreeing to talk anonymously said lessons in Uzbek classes are only lectures now. ‘Did cancellation of ORT in Uzbek also cause a decline in the quality of education? Some supporters of testing in Uzbek recall, that until recently two universities instructed in Uzbek in Kyrgyzstan - the Kyrgyz-Uzbek University (KUU) and the People's Friendship University (better known as “Batyrov’s” university of the disgraced Kyrgyz oligarch of Uzbek origin Kadyrzhan Batyrov). However, teaching there was practically conducted in Russian. Utkir Jabbarov, a graduate of “Batyrov’s” University told Fergana about this. Under the same law, general secondary education (16-18 years-old) is generally available, but not compulsory. These last years at school prepare graduates to enter university. As reality shows, no conditions are created to obtain high-quality school education, not to mention the possibility of obtaining a higher education for students of Uzbek schools in Kyrgyzstan. So, is education in Uzbek in Kyrgyzstan necessary or not? This question must be transferred from the political to the practical field and to correlate with reality. The authorities must answer if they want to see ethnic Uzbeks of Kyrgyzstan participating in the social life of the country and what measures they can offer so that Uzbek youth will receive a quality education.